The Seaside Clinic, formerly known as the Seaside Sanitorium and later known as the Seaside Regional Center, was designed as a medical center for the heliotropic treatment of children with tuberculosis. [Bendici-blog] As the name implies, it is located on the waterfront, on a scenic stretch of Connecticut coastline near Harkness Memorial State Park. The site was acquired by the Connecticut State Tuberculosis Commission in 1930, and the main building, known as the Stephen J. Maher Building, was opened to patients and dedicated in the 1934, a month after Gilbert's death. [CSLIB-Seaside] It functioned as a tuberculosis hospital until 1959 and then was briefly used as a Geriatric Center (1959 to 1961). It became the Seaside Center for the Mentally Retarded between 1961 and 1996. [CT-Trust-Seaside] The facility was closed in 1996, and it has been vacant since then. Seaside is listed on the National Register of Historic Places. [NRHP-Seaside-1995] Its prolonged state of abandonment has put it in danger of being lost to future generations. 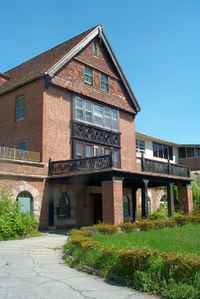 The main building of Seaside is considered an example of Tudor Revival architecture; however, the mature Gilbert used a variety of stylistic elements in his design. 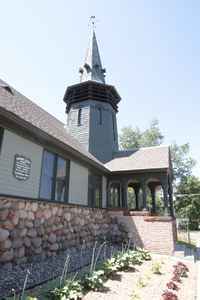 The entry facade with its gabled porch, stone arches, and lighthouse-like tower recalls the Romanesque idiom. 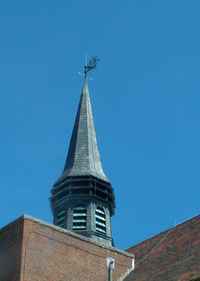 Colorful wood shakes on the gable ends and a tall spire are reminiscent of Gilbert's early churches in the Shingle Style. 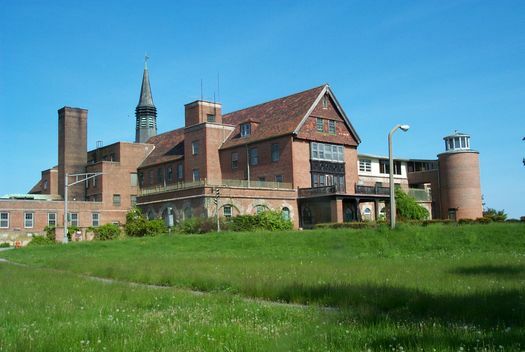 And the sea-facing elevation with its long massing, oriented to the sun and air as part of the tuberculosis treatment, and its formal symmetry reminds one of Gilbert's government buildings. National Register of Historic Places, Nomination Form for The Seaside (1995); Text: http://pdfhost.focus.nps.gov/docs/NRHP/Text/95001007.pdf (PDF), Photos: http://pdfhost.focus.nps.gov/docs/NRHP/Photos/95001007.pdf (PDF).